This centre has boosted cricketing opportunities in Devon for young cricketers, adults, talented players, clubs and Devon’s teams as well as the University’s cricket programme. The England and Wales Cricket Board provided £1.6 million funding from the Club Community Development Programme, which was made up of Exchequer funding and managed by Sport England. £250,000 was generously donated by Sir Christopher Ondaatje, and the Centre is named in his honour. Further grants were offered by the Devon Cricket Board, MCC, Lords Taverners, Devon County Cricket Club, the Tony Coles Trust. All clubs and cricket organisations are encouraged to use this high class facility and are welcome to visit at any time. It has been built for clubs to use so please enquire about bookings! For block booking discounts please enquire. Click here for information about 1:2:1 specialist coaching. A Google Map is available. Leave the M5 at Junction 29, signed Exeter Airport. At the traffic lights at the end of the motorway off slip road, turn right onto the B3015, signed City Centre, and at the first roundabout turn right, signed Exeter Business Park. Go straight over at the next two roundabouts, signed Pinhoe, and join the Monkerton Link Road. At the traffic lights bear left onto the B3212, signed City Centre. Take the right-hand lane and at the second set of traffic lights turn right, signed University. At the first roundabout take the second exit onto Union Road. Go straight over at the first set of traffic lights onto Prince of Wales Road. After a set of pedestrian crossing traffic lights the road curves to the left and the University’s Stocker Road entrance is on your right. Use this entrance for the main car parks, the Great Hall, Northcott Theatre, Xfi, and the Innovation Centre (see the Streatham Campus map). Continue along Prince of Wales Road and the University’s Streatham Drive entrance is on your right. Use this entrance for Holland Hall, Reed Hall and the Sports Park (see the Streatham Campus map). After the junction with the M5 (J29) follow the signs for Exeter Business Park. The route then follows the directions given under ‘From the M5’. If you are unfamiliar with Exeter or are travelling at peak times, when this route can be congested, we recommend that you join the M5 and follow the instructions from Junction 29. Alternatively, leave the A30 at the Dawlish and Marsh Barton turning. Turn left at the large roundabout into Alphington Spur (A377), which becomes Alphington Road. Continue on this road until the large Exe Bridges roundabout; Riverside Leisure Centre is on your left. Take the third exit (Bonhay Road), signed Exeter St David’s station. After passing the station on your left, turn sharp right at a double roundabout onto St David's Hill. Turn left at the first mini roundabout and then left at the next set of traffic lights into New North Road. Take the second right into Streatham Drive and the University’s Streatham Drive entrance is on your left. 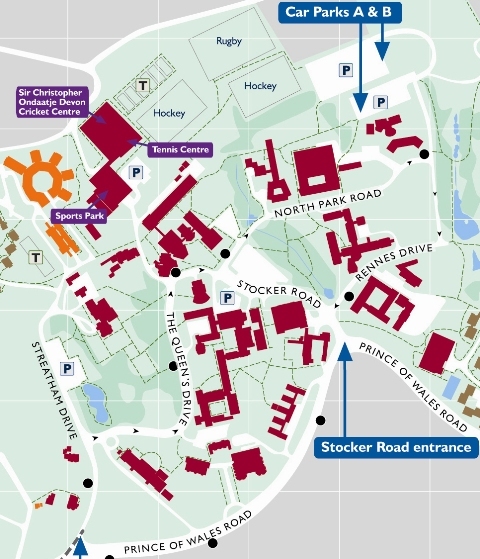 Use this entrance for Holland Hall, Reed Hall and the Sports Park (see the Streatham Campus map). For the University’s Stocker Road entrance bear right along Prince of Wales Road. As the road curves to the right the entrance is on your left. Use this entrance for the main car parks, the Great Hall, Northcott Theatre, Xfi, and the Innovation Centre (see the Streatham Campus map).